Feeding dogs a raw, or BARF – biologically appropriate raw food or bones – diet is becoming more commonplace as some people choose to seek an alternative to the processed and dried commercial foods. By following a few simple and common sense guidelines regarding hygiene (always scrupulously cleaning preparation surfaces and washing hands) and safety (totally avoiding cooked bones which can splinter and cause potentially fatal injuries), and by using a reputable and specialist supplier like VioVet, the switch can be straightforward and the reported benefits numerous. Natural. The raw food diet is evolutionarily suitable. A biologically appropriate diet for a dog is raw whole foods - similar to those eaten by wolves and dogs' wild ancestors – such as muscle meat, bones, fat, offal (organs etc), fruit and vegetables. ‘Real’ food. As humans, we know to avoid ready meals and highly processed foods, packed full of chemicals, additives and those dreaded ‘E’ numbers. Have a look at the ingredients on a pack of dried dog food and see how many you recognise. Improves dental health. Dogs’ teeth are meant to grind bones and many proponents of this method of feeding claim that doing so actually cleans and strengthens the teeth and helps scrape off plaque. Some also believe that the breath smells better. Economical. A kibble-fed dog will often need to eat more as these foods tend to be packed with unnecessary fillers and grain – with a raw diet every last morsel is valuable nutrition. Helps maintain healthy weight. Again, avoiding those fillers and cereals can help avoid weight gain. Better skin and coat condition. Those feeding the BARF diet regularly report a shiny, healthy coat and fewer allergies and skin problems. This could well be due to the high nutritional value of the raw foods as well as eliminating additives and chemicals. Better digestive health. Feeding the way nature intended may help the digestive system function as it should as dried food can take time to digest and even cause bloat. Frozen complete raw formula foods are now available from our website, so why not take the doubt and inconvenience away. 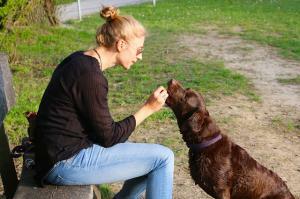 The wise dog owner will research their options, introduce any changes gradually, and observe their dog closely. If you need any advice on raw feeding, please don't hesitate to contact us.